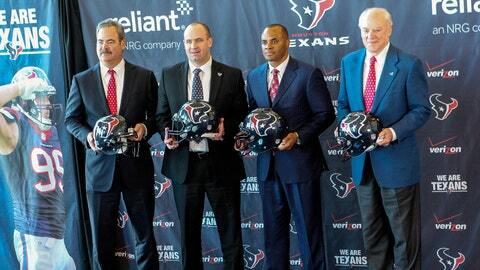 (From left) Cal McNair, Bill O'Brien, Rick Smith and Bob McNair pose as O'Brien is announced as the Texans' new head coach at Reliant Stadium. The Houston Texans are in major need of a fresh start. After ending the season on a 14-game losing streak, the Texans hired a fresh, new coach in the form of Penn State’s Bill O’Brien. The Texans are also in a position to get some fresh talent having ‘earned‘ the No. 1 overall pick at the 2014 NFL Draft from May 8-10 at Radio City Music Hall. But that doesn’t mean they are necessarily going to use it. During Friday’s introductory presser to introduce O’Brien, the topic of the pick came up. "Just getting here yesterday, we’ve already started some of these discussions, but they’re very preliminary," O’Brien said. "At every position, we want a good team guy," he continued. "We want a guy that is a hard worker, a guy that’s physically tough, mentally tough, smart guy. It doesn’t matter what position it is. To me, it’s a guy that understands the team concept and understands that it’s not about individual stats or individual performances. It’s about doing what’s best for the team and being a good teammate. So whether it’s a quarterback or defensive end or linebacker or wide receiver, that’s what we’ll always look for here at Houston." But then Texans owner Bob McNair chipped in to make it known they were open to trading the pick. "Maybe we’ll trade down and still get a quarterback that can do the job and get an outstanding defensive player," McNair said Friday. "It’s an exciting time. Everything’s a moving target. Lot of different pieces." Some of the big names that could possible take the No. 1 overall position include defensive end Jadeveon Clowney and quarterbacks Teddy Bridgewater, Blake Bortle and Johnny Manziel (assuming he declares). The Texans had visible struggles with the quarterback position this season, rotating through three without settling on any of them. Given the multiple talents up for grabs at the quarterback position this year, it is possible for the Texans to trade the pick and still get the man they want need.